One of the two primary green-skinned grapes of Bordeaux (where it’s most often blended with its traditional partner, Semillon), Sauvignon Blanc is, as far as we know, a French native, and it is widely cultivated around the world, notably (in addition to France) California, Washington, New Zealand, Chile and South Africa. 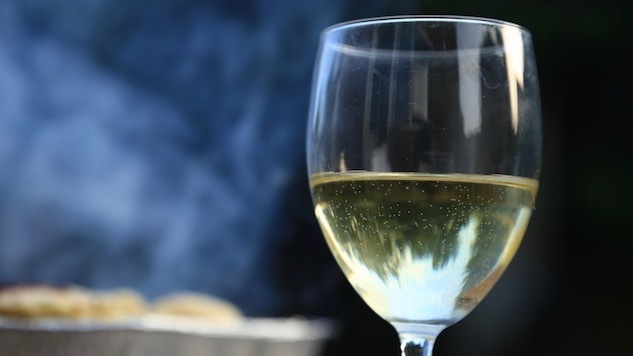 Sauvignon Blanc is a grape whose signature flavors and aromatics depend heavily on climate: In cool zones it can be almost aggressively grassy and vegetal; in hot ones, a tropical fruit-bomb without much in the way of a bouquet. In its sweet spot it is crisp, balanced, elegantly acidic and a little voluptuous. It has a more unctuous character than super-light Pinot Gris but is less of a heavyweight than an oaked Chardonnay, so it can be a great crowd-pleaser, and very versatile with food. A good Sauvignon Blanc has tangy acidity, some tropical fruit notes, and an agreeable greenness. The suggested bottles below happen to be things I’ve tasted recently; there are many significant regions not noted here. Be on the lookout for Sauvignon Blancs from Alto Adige and Friuli in Italy, Washington State, the Loire Valley in France, and the Cape of South Africa among others. There are many styles of Sauvignon Blanc and it’s one of those wines that, if you think you don’ t like it, you might just not have found your region yet. When the cork is pulled on this wine, oysters everywhere experience panic attacks. Actually, I don’t know anything about oyster emotions but I do know that if you have a plate of them in front of you, a glass of this would be a great thing to have in your hand. It’s a splurge relative to most of these bottles, but noteworthy for its lusciousness and nuanced layers of tropical fruit notes-I get everything from guavas to gooseberries, with citrusy acidity and balance a gymnast would envy. Oh-this one can age, too. At least 5 years, maybe more. It will develop a rich, sherry-like character if you hang onto it for long enough. Good luck with that, though. It really doesn’t get any more Napa Valley than Charles Krug, and this venerable landmark could probably upcharge the heck out of their Sauvignon Blanc if they so chose. Happily, the price point remains accessible and the quality is knockout. I’m not too proud to admit I have had this wine for breakfast. If you want to know what wine geeks are talking about when they use the term “bright acidity” this wine defines it. The current release has a faint grassiness (it feels fresh and isn’t too aggressive) under primary aromatics of grapefruit and lime zest. Some tropical notes in the mouth (passionfruit and a hint of melon) but not overripe. Stony on the finish. Liquid sunshine. Fetzer’s celebrating 50 years of affordable crowd-pleasers this year-this one’s quite a grassy character on the nose, with unfolding layers of pineapple, kiwifruit and lime leaf. I expect it would be a friend to many foods, especially things that come from the sea. From the Lafite (Domaine Barons de Rothschild) wine universe, this is, in typical Bordeaux fashion, blended with Semillon (and a bit of Sauvignon Gris). The Légende Bordeaux Blanc is fresh, lively, and a bit of a seductress. Or at least a flirt. Big on citrus and stone, this is a great affordable Bordeaux Blanc. This is a food wine for sure, and it’ll get along agreeably with white fish, pretty much anything in the crustacean family, or simple poultry dishes. It’s a “drink it now” wine that isn’t there to be worshipped: It wants to socialize. Okay, these ladies have a very cool story. One raised on California’s central coast and one in New Zealand, they both grew up around winemakers but without a clue that they had a sibling on the other side of the world. Once they found each other, the obvious thing to do was launch a winery that… well, created a family out of wines from opposite sides of the world. Their Sauvignon Blanc is from certified-sustainable New Zealand fruit. I’m going to be honest, I know New Zealand is considered primo territory for Sauv Blanc but I don’t often love it. This one’s really lovely, with more floral notes than you often find in the varietal, lots of jasmine and citrus blossom. Also notes of passionfruit, nectarines and grapefruit. No, I am not going to shut up about Quivira and move on. I love them. A winery to support for its good eco-creds as well as tastiness, Quivira knows its way around a Sauv Blanc and this one is a crisp, elegant, super-pleasurable glass of wine. Aged in oak and acacia wood barrels, it’s a rounded wine with a strong Meyer lemon note, along with pineapple guava. Richer than average for the varietal (which is often aged in steel) it’s a Sauvignon Blanc worth looking out for and splurging on, as it’s a limited edition and won’t be around forever. (Any SB from this winemaker is worth your time, though, so don’t fret if you can’t find this one). Food friendly in general but this is one I’d happily drink on its own. On the grassier end of the spectrum but also with a lot of melon and passionfruit flavors. There’s a hint of peaches and a little bit of honey; acidity is vibrant and lime-driven. Pleasant minerality. The winemaker recommends serving it with seabass, and I’m not going to argue, but you can probably play around here. I think it might be good friends with a white pizza. Or anything involving fresh goat cheese. Rich mouthfeel, and if you like your Sauv Blanc to hit the “vegetal” end of the spectrum this one’s got a significant green chili pepper thing going on. Various green herbs roll over the palate along with the passionfruit and citrus tones. This wine would enjoy a night out with shellfish. This single-vineyard SB is pretty lavish, a vibrant array of mango, pineapple, melon and nectarine. The nose is somewhat stony but I get more fruit than mineral on the finish. Good balance overall, lively and easygoing.